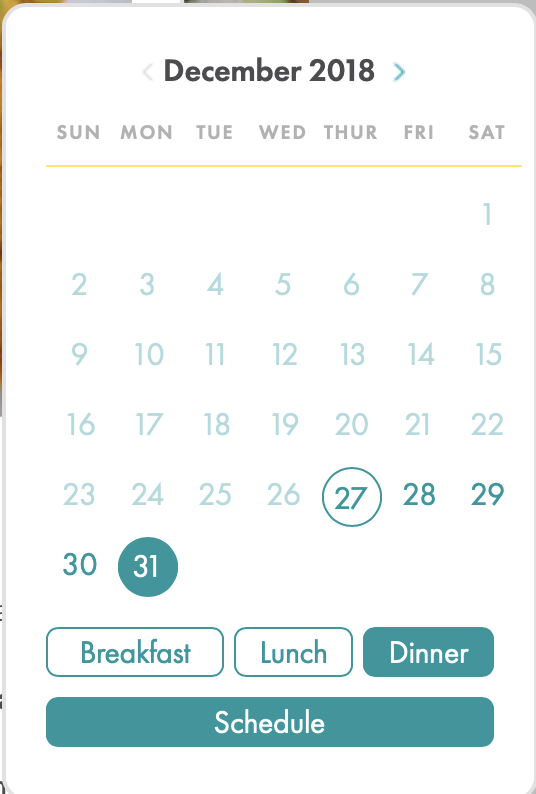 To get to the Recipe Box, click on “Recipe Box” in the upper left of your Meal Planner. Once you find a recipe you want to try, you can add it to your Meal Planner without ever leaving the Recipe Box! There are two ways you can do this. If you see a recipe you want to add to your Meal Planner,place your cursor over the recipe and select “Schedule”. If you think you might want to add the recipe but want to look at the ingredients and procedures to make sure, click on”View” to open the recipe card so you can give it a look. If you decide to add this recipe to your Meal Planner, Select “Actions” in the upper right corner of the recipe card, and then click on the calendar icon to schedule the recipe. After clicking on “Schedule” from the recipe’s picture or using the calendar icon from the recipe card, you will see a calendar pop up. This is where you can schedule the recipe to appear in the Meal Planner. 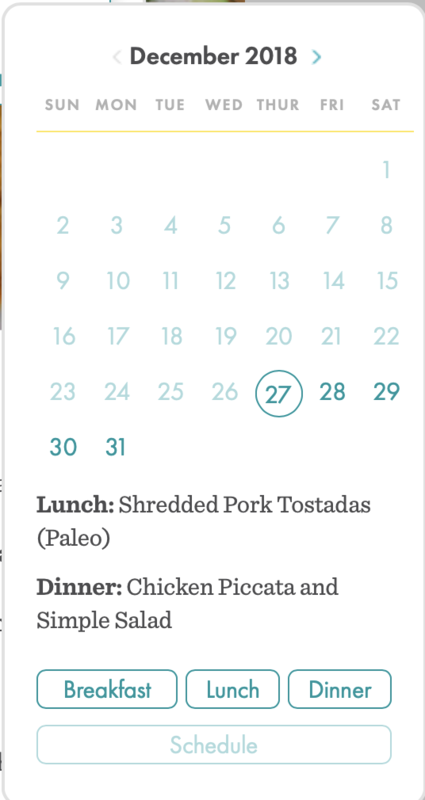 Click on a date to see what meals are already scheduled on that day. This will help you decide which day to schedule this recipe. Once you have decided on the day, select if you want this recipe for Breakfast, Lunch, or Dinner. When you have clicked on the day and the meal you wish to schedule the recipe, the day and meal you selected will be highlighted, and the word “Schedule” will turn blue, telling you that your Meal Planner is ready to accept this recipe. If you are happy with your selections and wish to add this recipe to your Meal Planner, click on “Schedule”. Your recipe will be added to your Meal Planner on the date and meal slot you selected. If you want to continue to explore the Recipe Box and schedule other recipes, click on “Stay in Recipe Box”. If you want to view your new menu with the recipe you added, click on “Go to Meal Planner”. If you scheduled a recipe that you wanted to have in place of a recipe that was already scheduled, be sure to use our Drag-and-Drop Meal Planner to drag the meal you want to replace to the trash bin or to a different day or meal slot. Your Shopping List will automatically be updated to reflect these changes.